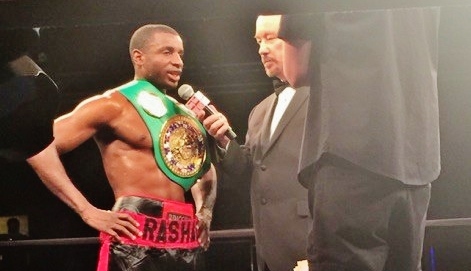 On Friday night, May 15, Rashad Ganaway scored a big victory by out boxing Leon Spinks III over eight rounds in Salt Lake City, Ut. to capture the vacant WBC USNBC lightweight belt. Ganaway had fought for the same title in his previous fight against Jesus “Chuy” Gutierrez, dropping a majority decision after eight rain-filled, raucous rounds of action. Ganaway appeared to be primed for a big win, however, as he won handily vs. Spinks, by scores of 79-73 and 78-74 twice to turn his career back around. Now 15-5-1 with 9 knockouts, the 32-year old Ganaway should be able to position himself for a nice fight. We caught up with RHP’s Towan ‘T’ Butler, who has worked closely with Ganaway his past two bouts, to get his thoughts on what this victory means for the Little Rock, Arkansas native. Check the video below for more.